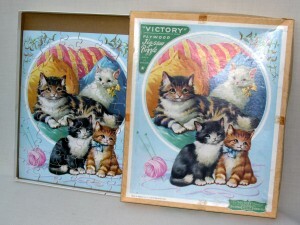 For me, one of the most evocative items is a piece from an old wooden jigsaw puzzle. The feel, the smell and the slightly blurred colouring instantly whisks me back to my childhood, where, as a three-year-old, I used to carry around a large bag containing around fifteen wooden puzzles – all mixed up! Goodness knows what had happened to the pictures, but it didn’t matter, I could easily sort them out. Some of them could be matched by colour, others by shape or by the grain of the wood. I loved my puzzles. As I grew older, I was given jigsaw puzzles with more pieces. One of my favourites was the sailing of the Mayflower from Plymouth, whilst another featured the Queen Mary, the large ocean liner with three funnels. Puzzles must be one of the few toys that can be enjoyed by a very young child as well as their grandparents or great grandparents. Even toddlers can manage a simple two or three piece puzzle, although adults usually prefer something slightly more complicated! I think that five hundred or a thousand piece jigsaw puzzles are a nice size, though many people prefer them to be even larger. The largest puzzle made so far contained 24,000 pieces, but unfortunately most of us would have trouble fitting that onto the dining room table! Most researchers agree that the first jigsaw puzzle was produced in 1762 by John Spilsbury, an engraver and mapmaker from London. 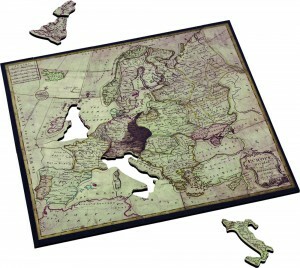 He used a fine saw to cut around the borders of countries of one of his wood-mounted maps, and ended up with an educational toy. For almost a century the jigsaw puzzle – or ‘Dissection’ as it was then known – was regarded as a teaching aid for children. Gradually, however, adults began to enjoy them too, and in 1880, when the treadle saw was introduced, the dissections gained the name of ‘jigsaw puzzles’, soon being mounted on plywood rather than the earlier mahogany. Early puzzles often still show the pencil cutting lines on the back. This year, 2012, is the 250th anniversary of the wooden jigsaw puzzle, and although John Spilsbury died when he was only thirty years old, what a wonderful legacy he left behind. By the end of the 19th century, cardboard puzzles were also available, though mainly intended for children. A new technique was introduced for cutting cardboard in the 1900s, which involved twisting thin strips of metal into complex patterns. The metal was sharp around the edges, a bit like a pastry cutter, and the whole contraption was fastened to a plate to make the die (the name given to the complete twisted metal assemblage). It was then placed in a press and the cardboard was cut. These die-cut cardboard puzzles meant that the medium could be cut much more quickly, and of course, cardboard was cheaper too. Even so, wooden puzzles still dominated the market, no doubt because manufacturers were worried that people would not like the ‘cheap’ cardboard versions. Companies such as Victory, J.W. 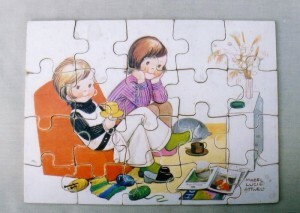 Spear and Chad Valley were soon producing thousands of puzzles, allowing children and adults to relax with a jigsaw on a rainy day or in the evenings. 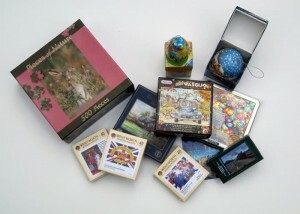 Over the decades puzzles have become ever more inventive, including such types as montage, foil, felt, magnetic or circular. Some, intended for those who like their puzzles to be fiendishly difficult, just consist of a picture of baked beans or thousands of tiny sweets, while others don’t show a picture at all, and you need to guess the subject portrayed. Many people enjoy the 3-D puzzles that build up into a house or a landmark, while other puzzles can be made into balls and hung up as a decoration. Floor puzzles are fun for small children, as are peg puzzles, which usually consist of a printed tray with lift-out pieces that have pegs attached to make manipulation easier. Sometimes the puzzle is of a house, revealing the rooms when the windows and doors are lifted, or maybe it is a farmyard scene that discloses the animals in the barn when the pieces are moved. 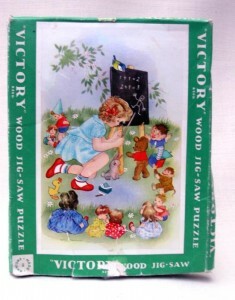 As well as the usual interlocking pieces, many earlier wooden puzzles featured ‘whimsy’ pieces. These were introduced towards the end of Queen Victoria’s reign and added interest and appeal to the jigsaw. They were shaped pieces such as an animal, leaf, fish or key and were called ‘whimsy’ pieces as they were ‘cut on a whim’, by highly skilled cutters. In the first few decades of the 20th century, jigsaw puzzles were a very popular craze and by the 1950s, most puzzles were cardboard, apart from those intended for small children. Nowadays, puzzles seem to be enjoying a revival. One of the most interesting things about many jigsaw puzzles is how they reflect the happenings of the day. They provide a wealth of social history information – often in small details such as a puzzle showing a child with a china doll, or a family in an early motor car, or maybe they depict trades-people such as the milkman or postman. They might show scenes from children’s past television shows – Wombles or Sooty – or depict early planes or magnificent steam engines from bygone eras. Popular today are the Wasgij (Jigsaw backwards!) 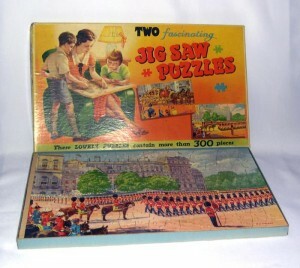 puzzles, produced by Jumbo Games. They are brainteaser puzzles that really make you think, as the picture on the box is not the end result – it is just a clue. The puzzles show amusing characters in comical situations; for instance the picture on the box may depict a crowd of people on a beach looking horrified but the actual puzzle will show a boat looming out of the sea onto the sand. Modern magnetic puzzles are intriguing. They are very colourful and, although they are similar to a conventional puzzle (except that they don’t interlock) the picture on each puzzle piece changes according to the angle it is viewed. Also, you can’t recognise the corner or edge pieces, so they can be difficult. Some are called ‘Optillusion’ and consist of designs that really tax your brain and your eyes. There are cogs or squares that appear to move, spirals that seem to rotate and colour-changing kaleidoscopes. Others depict a massed montage of creatures such as ladybirds, fish, butterflies or sharks. 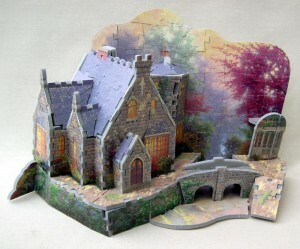 These puzzles are all made by a games company called Cheatwell! 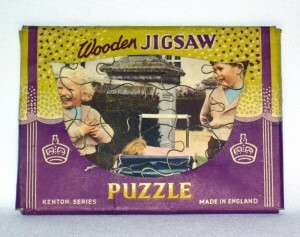 Wooden puzzles are still produced by a few manufacturers in Britain today. The Wentworth Wooden Puzzles company create beautiful jigsaws, and many are complete with whimsy pieces just as they were a century ago. Using the latest technology, their designs are individually cut from wooden board which comes from forest managed on a sustainable basis. Their smallest puzzles are the 40 piece Micros and the largest are the 1,500 piece Majestic series. The designs are varied; this year Wentworth has produced several to commemorate the Queen’s Diamond Jubilee. They have also issued a reproduction of John Spilsburys’ Map of Europe, c.1762, which has the country boundaries cut out, just like the original. I must admit that as much as I enjoy cardboard puzzles, I think there is nothing quite as satisfying as a wooden jigsaw. The pieces of the wooden ones are satisfying to hold, and they feel substantial. Nostalgia-wise, they whisk me straight back to my childhood, reminding me of that little girl I once was, heaving around a huge bag of jumbled up jigsaw puzzles.